Well, you may know that this blog gets imported into my facebook notes. Facebook's import process frustrates me because quite often it stops working for awhile. When I report an issue with the import, I get an email back saying someone is looking at it and it might help if I send a screen shot of "the error". There is no error to send them. The process just stops working for awhile. I've decided to give up on Facebook's import process. Instead, I'm starting to use twitterfeed.com . I already use twitterfeed to "tweet" my blog and updates to SheppyBrew.com to twitter (http://twitter.com/esheppy if you want to follow my tweets). Since facebook has its own little utility to import blogs into notes, it has always seemed silly to use twitterfeed to post to my facebook wall, but since I've given up on the facebook utility, I'll go ahead and do it. So, this is a test post to see how it works. 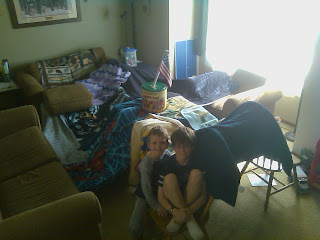 If you are my facebook friend, let me know if you like this the same, better, or worse than reading my blog as a note. Today around lunch time, I noticed that May 2011 has surpassed September 2010 as the month with my blog's most "page views". The total in September 2010 was 1008, and was by far the most popular month for my blog (until this month, of course). 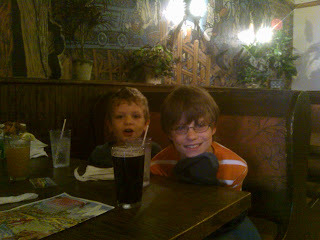 I posted quite a bit in September 2010 about my GABF experiences , and I know quite of few of my virtual-friends from the Mr. Beer community stopped by to read those posts. Since blogger has started providing the stats, this blog averages around 740 page views a month, so getting more than 1000 is pretty significant. At 12:30 today, the total for May was at 1011, and May is not even over yet. AND ... most of my posts this month have not even been imported into facebook, yet. The popularly of "Cider Drinking and Breast Flashing" caused a huge portion of the traffic this month. Personally, I think just about any of the other blog posts this month have been more interesting, but I guess people just really like cider, and were excited about finding out how mine turned out. I am pretty sure this month will also be record-breaking for the SheppyBrew Nano-Brewery. Since I've started brewing, I don't think I've gone a month without brewing at least one batch of beer. This month, I am giving myself half a batch because the only brewing SheppyBrew did this month was on the Beer Model's Brew Day, and the Beer Model did at least half the work on that brew day. I didn't literally go through the SheppyBrew Brewing Calendar to see if I actually have brewed every month, so it is possible that I am wrong about this record, but I am pretty sure about it. I also did not brew much in April. 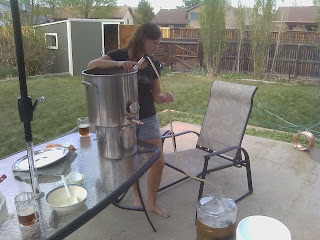 My only brew-day in April was a batch that got split into Gringo Cerveza Cream Ale and Gringo Cerveza Jalapeño Cream Ale. Despite the fact that I have not brewed very much over the past couple of months, my home-brew inventory is at an all-time high. I do not really have room to store more beer. My beer fridge is about full. I might be able to shove another home-brew six-pack into my "commercial" beer fridge, but not much more than that. There is even some home-brew in our food-fridge. And, now I have a keg in my kegerator and another getting ready to go in there. My conditioning coolers are not completely full, but almost, and I still have not gotten all my Gringo bottles out of the carbonation area of the basement. I'm either going to have to slow the brewing down even more, drink more, or give a bunch away. 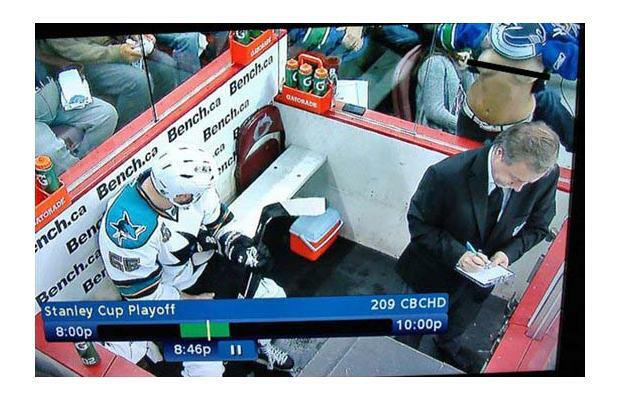 I may have to employ a combination of those tactics. But anyway, those two records are pretty exciting ... aren't they? I may have a celebratory home-brew or two to mark those two accomplishments. Hey, remember awhile ago in my post "Interesting Blog Stats", I mentioned that "Missing Wife, Bottling Beer, Women wearing very little" was a very popular post? Well, "Cider Drinking and Breast Flashing", my post from a few days ago, is doing even better than "Missing Wife, Bottling Beer, Women wearing very little" ever did. Who knew that so many people were interested in how my simple cider tastes? For the week (May 16 - May 23), "Cider Drinking and Breast Flashing" has 10 times as many hits as the next most popular blog post (Beer Model Brew Day is #2, which seems much more interesting to me) . For the month (Apr 23 - May 22), "Cider Drinking and Breast Flashing" has 5 times as many hits as the 2nd most popular blog post (Tweedle Beetles is #2, which always mysteriously does quite well). All time (since May 2009), "Cider Drinking and Breast Flashing" is already ranked #3 behind only Poison Rationality and Tweedle Beetles). That is pretty impressive for only being up for 4 days. My blog has never gotten this much traffic over any 4-day period. AND, this post has not even been imported into my Facebook notes, yet. So, I guess there is an obvious question to be asked. Why are so many people interested in reading my tasting notes on the hard cider that I brewed? I honestly have no idea. Seems odd considering that I'm not even a big fan of my cider. I am sure that the visitors have their reasons. For some reason, I'm getting a much higher rate of visits from Canada than I ever remember getting before. Maybe Canadians really like their home-made hard cider. If I do a google search on the keywords vancouver breast flashing cider, the blog post, and my blog are the top two results. Pretty cool, hey? Here is a photo of SheppyBrew's Gringo Cerveza Jalapeño Cream Ale, which really has nothing to do with the topic of this blog post. It is a pretty picture, though, isn't it? Not only is the beer visually attractive, but I think it tastes much better than my hard cider. I've talked about Tommyknocker Brewery quite a bit in this blog. It is a brew-pub in Idaho Springs that the Colorado Shepards go to quite a bit. I like the location. I like their story. I like their food. I like their beer. Additionally, they have the best AHA pub discount out of all the places I've used my discount so far. We end up there for lunch quite a bit after spending the morning in or around Idaho Springs. Quite often, we plan return trips from the mountains so that we end up by Idaho Springs around lunch time as well. Recently, Tommyknocker Brewery significantly updated their website. I think the new site looks much better than the old one. They also updated the look of their graphics for logos, packaging, etc. Personally, I thought the old logo and other graphics were great, but I will probably get used to the new look. According to their web-site, they are expanding. That is good too. But, to me, the best news is that they decided to make their Hop Strike Black IPA a regular member of their beer lineup. Last time I asked, the bartender I was talking to told me that it was just a seasonal and would not be around too much longer. I communicated my disapproval. I told him that Hop Strike was the best beer they make. Apparently, he agreed and convinced the owners and / or brewers to keep it on tap permanently. I'm sure all he had to tell them was "Hey ... Shep wants us to serve Hop Strike year-round". 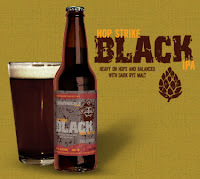 Not only are they keeping the Hop Strike Black IPA as year-round brew, but they have started bottling and distributing it. Personally, I rarely buy Tommyknocker beers from a liquor store since I go to the pub so much, but it is nice to know I can get it if I want to "down here" in the metro area if I want to. And, in fact, when I saw some in the liquor store, I did grab a couple of bottles. 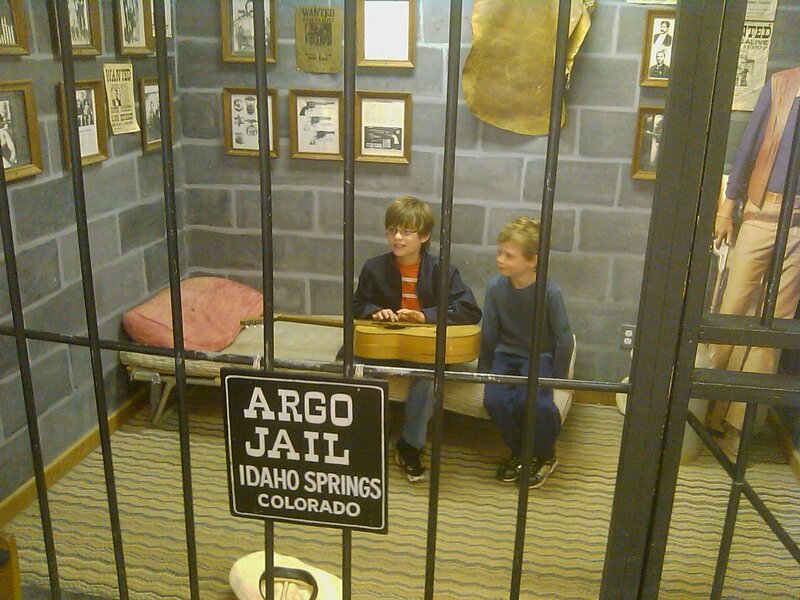 Yesterday, we decided to go to Idaho Springs and visit the Argo Mine and Mill. This gave me the opportunity to go to Tommyknocker and buy a hat with the "old" logo on it. Of course since we were there, we had lunch and I had a couple of beers. Here the boys are in jail at the Argo mill. Here the boys are at Tommyknocker Brew Pub. 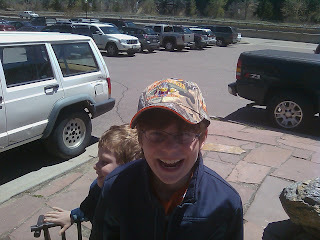 Tyler thought it would be funny to steal my hat. 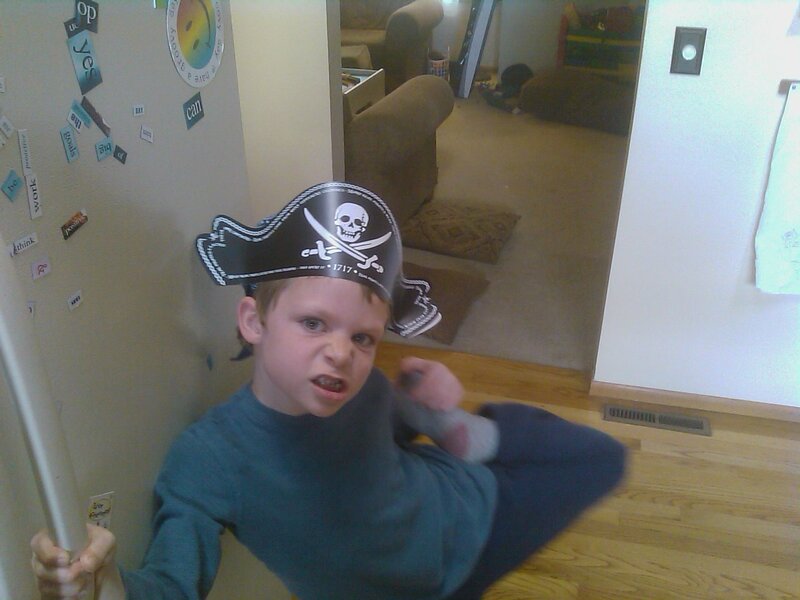 This is some random pirate who made his way into our house. Sunday (after coming to terms with the fact that we had not been raptured), the Beer Model and I kegged up her Summer Lovin' American Wheat Ale. We had over 88% attenuation, which means the beer is almost 6% ABV. That is a bit higher than we were shooting for, but the sample tasted pretty much exactly how I had expected it to taste. 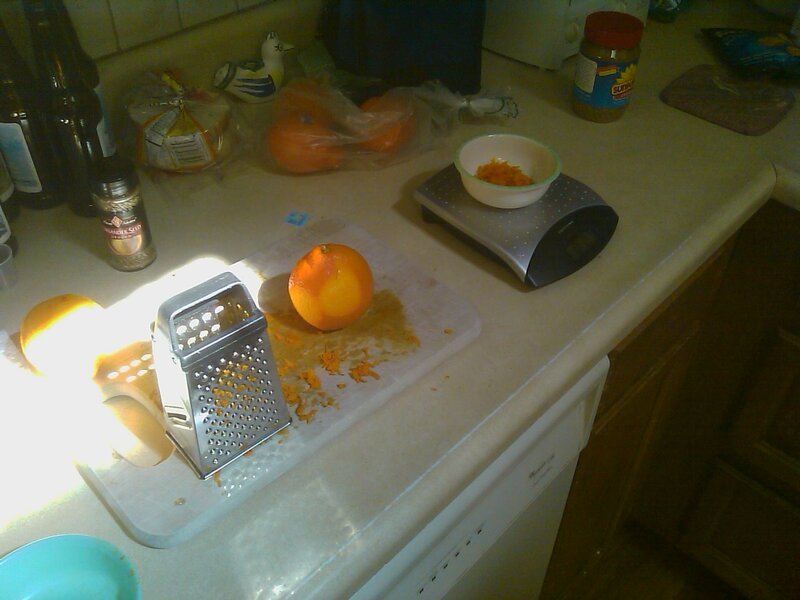 It is light with just a touch of citrus flavor from the orange peal and coriander. We are force-carbonating it right now at about 31 psi. Its carb level should be a bit higher than my first keg. Tracy is hoping to share this with her family when they come to visit in July. I'm a little afraid that if that is the goal, we should have brewed it a bit later. We'll see if it lasts. 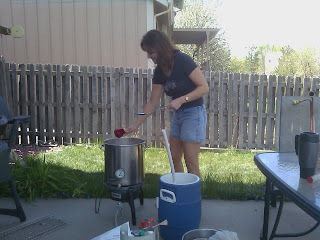 As I mentioned a couple of weeks ago, this past Saturday was National Home-Brew Day , and my wife decided to help brew a wheat beer that she called Summer Lovin' American Wheat. 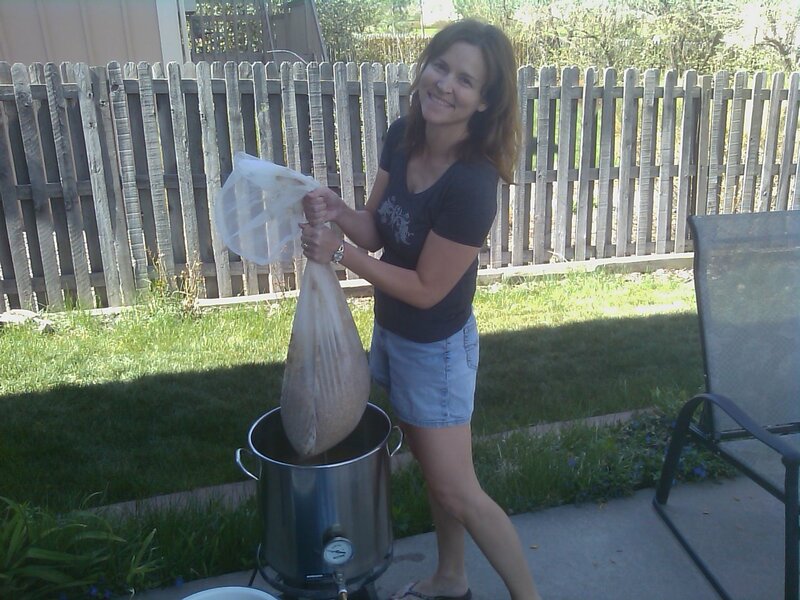 This was the Beer Model's second brew day, and SheppyBrew's first all-grain wheat beer (BIAB). The brew day gets started a little later when I have to wait for the Beer Model to wake up. But, it is ok, because she is so pleasant to look at. We pretty much shared the brewing workload, although somehow I got stuck with the clean-up. The Brewing day went pretty well. We got a bit over 5 gallons into the carboy, and it was bubbling away nicely on Sunday and Monday. I would have preferred to get a bit more wort with a little less of the cold-break material. I think I need to start designing my recipes to leave a bit more of the wort behind in the brew kettle. I'm also thinking I may want to get a pre-chiller for cooling down my wort in the summer. 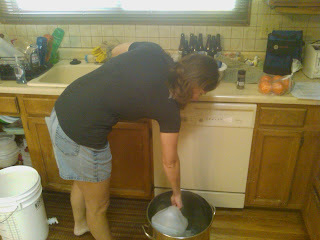 The wort went into the carboy at around 70, which is ok, but I prefer to get it down closer to 60. Plus, the weather was nice and warm, but not as hot as it will get later in the summer, so cooling will just be getting more difficult as the weather gets warmer. Another thing we did was compare beers from the newest version of Buckwheat's BPA. This batch was an experiment where I brewed up 5 gallons of wort and split the it into 2 Mr. Beer fermentors. 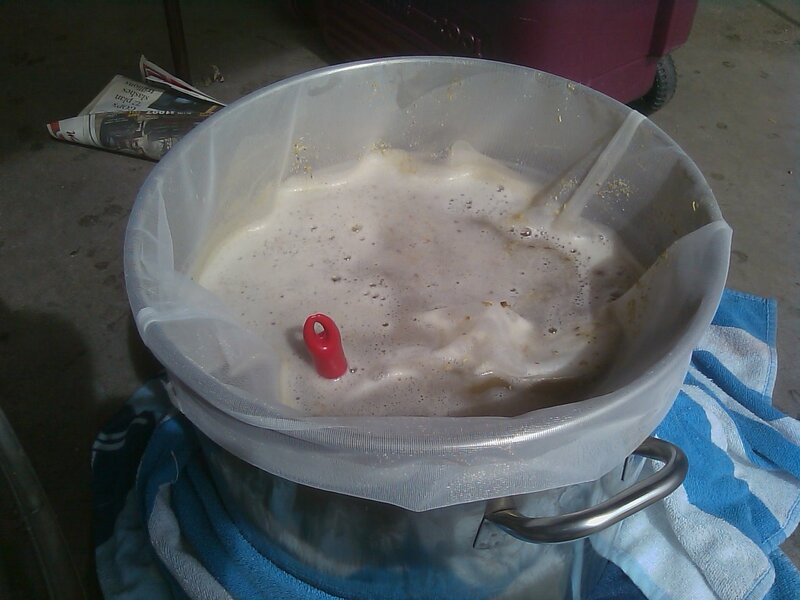 In one fermentor, I pitched SafeAle US05 yeast and in the other I pitched Safbrew S33 yeast. 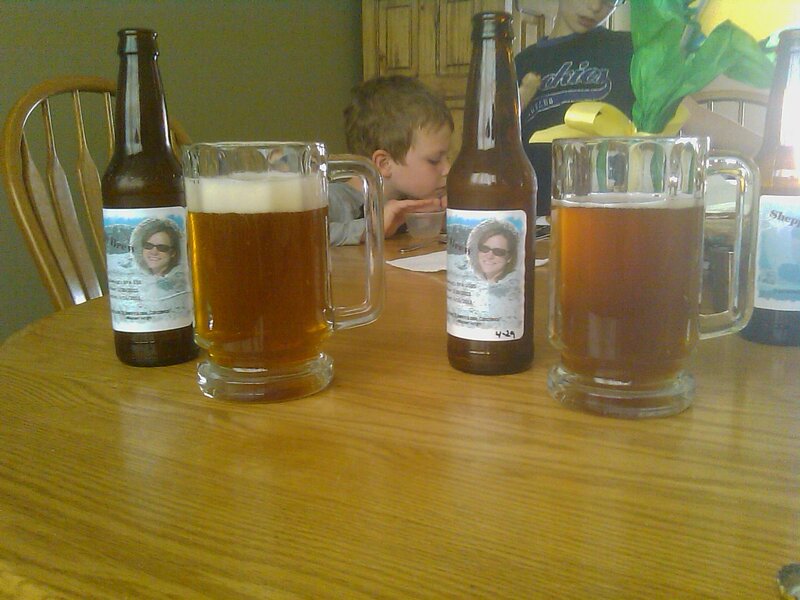 The idea, of course, was to see which beer the Beer Model preferred. Personally, I tasted a little more of a subtle fruity "Belgium" character in the S33, but not enough of a difference to declare one my favorite over the other. The Beer Model decided that she did prefer the S33, which was a bit of a surprise to me. I am pleased with this result, though, because it means I probably picked the right yeast in the original recipe. The fact that I picked up a little of the Belgium funk in the S33 makes me feel a bit better about calling this beer a Belgium Pale Ale as well. I think we are done experimenting with Buckwheat's BPA. S33 is the winner! The boys built a fort in the living room during the brew day. Summer Lovin' American Wheat looks like it will be a beautiful pale-gold color. It should be light and refreshing with a subtle orange zest and coriander flavor. It should be on the malty-sweet side with just a touch of honey flavor. It will be pretty dry and relatively low in alcohol. We are going to keg this beer, and if it lasts, share it with the Beer Model's family when they come to visit this summer. If it does last until then, I don't expect it will last much longer. We might have to brew it up again before the summer is over. This morning, I heard on the radio that the L.A. Dodgers are in danger of being unable to make payroll this month. According to this article on MLB.com, the L.A. Times has reported that this is indeed the case. I guess MLB will have to bail out the team like they did for the Texas Rangers last year. Obviously, Frank McCourt (owner of the Dodgers) is having problems. He's in the middle of a very public and nasty divorce, and that is expensive. Even before the divorce proceedings started, it sounds like his wife was expensive. He has an expensive mansion, an expensive private jet, and many other expensive things that he must pay for. He has a very large debt load, which is pretty expensive as well. But, even so, I'm not sure how the L.A. Freeking Dodgers get into so much financial trouble. According to this article on forbes.com, the L.A. Freeking Dodgers are worth 800 million dollars. Only the Bo-Sox ($912 million) and the Yankees ($1.7 BILLION) are worth more. L.A. Freeking Dodgers' debt to value ratio is 54%, which is high, but not anywhere close to teams like the Chicago Cubs (75%) or the Texas Rangers (66%). The same article says that the L.A. Freeking Dodgers have the 4th largest revenue in the league ($246 million) behind only the Cubs ($258 million), Red Sox ($272 million), and Yankees ($427 million). According to this USA Today.com article, the 2011 salary of the L.A. Freeking Dodgers is $104,188,999. There are 11 teams above them in total payroll. Some teams with higher payrolls are the world-champion Giants ($118,198,333), the perennial pathetic Chicago Cubs ($125,047,329), the Phillies ($172,976,379), and of course the New York Yankees ($202,689,028). So, the L.A. Freeking Dodgers pay a bunch in salary, but compared to the rest of the big boys in the league, not too much. As far as operating income (earnings before interest, taxes, depreciation, and amortization), the L.A. Freeking Dodgers are ranked 3rd in the league at $32.8 million. I have no idea how much profit the L.A. Freeking Dodgers make after paying off debt interest and pay their taxes, but their high operating income (compared to other teams) makes me think that the Dodgers should at least be doing OK. The Chicago Cubs: who have a 75% debt to value ratio and "only" have $23.4 million in operating income, and an annual payroll of $125,047,329. The Texas Rangers: who have a 66% debt to value ratio and "only" have $22.6 million in operating income, and an annual payroll of $92,299,264. The St. Louis Cardinals who have a 53% debt to value ratio and "only" have $19.8 million in operating income, and an annual payroll of $105,433,572. The Boston Red Sock: who lost $1.1 million before interest, taxes, depreciation, and amortization. Their annual payroll is $161,762,475. The New York Mets: who lost $6.2 million before interest, taxes, depreciation, and amortization and have a real high debt to value ratio at 62% and an annual payroll of $118,847,309. The Detroit Tigers: who lost $29.1 million before interest, taxes, depreciation, and amortization and have a real high debt to value ratio at 55% and an annual payroll of $105,700,231. One team we don't have to be worried about is the New York Yankees. As I stated above, they are worth $1.7 BILLION. Their debt to value ratio is a tiny 4%. They have a ridiculously high payroll at $202,689,028, but even with that huge expense, their operating income is a pretty healthy $25.7 million. So, I guess the point of this blog post is for all you baseball fans out there to beware. If the L.A. Freeking Dodgers can get to the point of not making payroll, it seems like there are an awful lot of other teams that could expect the same fate. Don't forget that the MLB uses revenue sharing to help the smaller market teams survive. According to this article on bizofbaseball.com, the total redistibution of wealth was $404 million in 2010. If teams like the L.A. Dodgers can't pay their fair-share of that total, I'm not sure what will happen to those teams that receive that count on those dollars to remain "open for business". But, even so, at least the MLB isn't in as much trouble as the NBA. (according to Forbes.com, over half of the NBA teams are losing money). The MLB is also not in as much trouble as the NHL (see this article on Forbes.com more than half of those teams are losing money as well). Sort of makes you wonder why the NFL is having such a hard time figuring out how to divide up its money ... doesn't it?